The Epson XP-345 is a multifunction inkjet printer performs the combined functions of copying, scanning and printing. It is a compact unit and is suitable for use at home or in a small office. 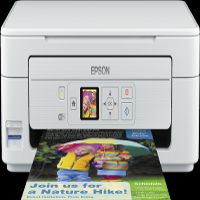 Being highly flexible, it uses features such as Epson Email Print, iPrint app and Creative Print app. The Epson XP-345 weighs just 4.3 kg and measures 15.3 x 11.8 x 5.7 inches. It’s easy to carry due to its less weight and can fit in limited space due to it’s small size. With a print speed of 33 pages per minute for monochrome and 15 pages per minute in colour, the printer has a print resolution of 5670 x 1440 dpi. As it uses contact image sensor, perfect copying is ensured and the print resolution is as much as 1200 x 2400 dpi. It uses individual Epson XP-345 Ink Cartridges. The interface consists of an LCD screen that has a diagonal of 3.7 cm and some controls associated with it. The memory cards that the printer accepts are SD and micro SD. The Epson XP-345 is a multifunction printer that can perform the functions of copying, scanning and printing. It has a compact size and is suitable for home or a small office. As it uses individual Epson XP-345 Ink Cartridges, it saves expenses. With a great printing speed and good print quality, it outshines most of the printers. How to rectify no print issue in Epson XP-345 Printer? Check for the printer driver. Reinstall the latest software for your printer, if necessary. One can use Epson Easy Photo Print to print the photos easily. Between the printer and the computer, a proper connection must be setup. Check for the ink cartridges status. If the ink level is low then replace the Epson XP-345 ink cartridge with the new one. If you are using the printer over a network, make sure that the printer is connected to the network. To check the network status, take a print of network status sheet. If the printer is not connected to the network, see to the network guide in the user manual. Try to connect the printer directly to the computer, if you are using a USB hub. If you are a window user then only follow this step: check for the print queue in the printer driver’s maintenance window. If there is any paused printing job, cancel it if necessary. Clear the offline of pending setting for the printer menu. Make sure you have selected Epson XP-345 Printer as the default printer. Follow this step, only if you are a MAC user. The printer status should not be paused. From the main menu, select system and preferences. Click printers and scanners (Print, Scan, & Fax) and double click on the printer. Click resume if the printer is paused. The Epson XP-345 ink cartridges must be installed properly in the cartridge carrier. If not then install them properly and take a test print to check the print quality. No print issue can be due to the clogged nozzle. Perform print head nozzle check and clean the nozzle, if necessary. Make sure you are using the Epson XP-345 ink cartridge which is compatible with the printer and is tested well. How to refill the ink tanks for Epson XP-345 printer? Refill the ink cartridge with the correct coloured ink up to the upper line on the ink cartridge. When storing or transporting Epson XP-345 ink cartridges after removing its seal do not tilt the bottle and do not subject it to impacts or temperature changes. Otherwise, the ink may leak even if the cap on the ink bottle is tightened securely. Keep the cartridge upright when tightening cap, and take the measures to prevent ink from leaking while you transport the cartridge. Q. Do I need to buy the ink cartridges separately or will receive a pack of ink cartridges with my new Epson XP-345 printer? A. You do not need to buy the ink cartridges separately, you will receive a pack of Epson XP-345 ink cartridges with your printer. These ink cartridges are started ink cartridges that are required to be installed when you use the printer for the first time. However, these starter ink cartridges are standard cartridges and may not have a high page yield. You can buy more ink cartridges for your printer once the starter ink cartridges are exhausted. Q. Is it possible for your compatible Epson XP-345 ink cartridges to cause any problems or damage to my printer? A. We assure you that our compatible ink cartridges will not cause any damage or problems to your printer. All our compatible cartridges are of high quality that are designed to work well with your printer. You will have a hassle-free experience when using our compatible cartridges with your printer. Q. The print quality of my printer has declined and it is advised that I perform a printhead clean to solve the issue. How do I perform a printhead clean for my Epson XP-345 printer? Load plain A4 sized paper in the printer. Choose “Nozzle Check” and then follow the instructions displayed on the screen to print a nozzle check pattern. If you notice any broken lines or missing segments, you will require a printhead clean to solve it. Select “Yes” using the up and down arrow keys to initiate the cleaning process. If you do not notice any issue with the nozzle check pattern, select “No” and then press OK to exit. Follow the instructions on the screen to complete the printhead cleaning process and then perform the nozzle check by repeating the steps given above. Q. How long will it take for you to deliver the Epson XP-345 ink cartridges that I order from your website? A. Please note that our delivery service works during weekdays from 9 am to 5 pm. If you place an order for any of our products before 12 pm, then the product will be dispatched on the same day and will be delivered to you within 1 - 2 days. Q. How much ink is supplied in each of the Epson XP-345 ink cartridges? A. The ink volume of the black cartridges (T2991) is 17 ml and the ink volume of the colour cartridges (T2992 Cyan, T2993 Magenta, T2994 Yellow) is 13 ml. Q. When should I clean the print head of the Epson XP-345 printer? A. You should clean the print head if the nozzles are clogged. The nozzles are clogged when the printouts become faint, there is visible banding, or unexpected colours appear. When the print quality has declined, use the nozzle check feature and check if the nozzles are clogged. If the nozzles are clogged, clean the print head. Q. Can I take printouts directly from my Android smartphone without using a PC? A. Yes, you can take printouts directly from your Android smartphone by using the Epson iPrint app. This application allows you to print photos, documents and web pages from a smart device such as a smartphone or tablet. You need to make sure that your device is connected to the same network as your printer. Q. Why is the color ink cartridge used even though I print in black and white only? A. To keep the print head clear and ready to print, the printer uses a small amount of ink from all the cartridges whenever it prints. This is why even if you select Black/Grayscale, some color ink is still used. Q. What interfaces does Epson XP-345 support? A. The interfaces supported by Epson XP-345 include USB and Wifi. Q. I recently ordered a multipack of Epson XP-345 ink cartridges. How can I track my order? Q. What sizes of paper can the Epson XP-345 printer print on? A. The Epson XP-345 printer can print on paper sizes such as A4, A5, A6, B5, C6 (Envelope), DL (Envelope), No. 10 (Envelope), Letter Legal, 9 x 13 cm, 10 x 15 cm, 13 x 18 cm, 13 x 20 cm, 20 x 25 cm, 100 x 148 mm and 16:9. Q. Does the use of compatible Epson XP-345 ink cartridges help the environment? A. Yes, the use of our compatible cartridges helps in conservation of the environment. This is because our compatible cartridges are made from recycled cartridges that have been used previously resulting in very little usage of new materials or components. Q. What measures should I take in order to keep the Epson XP-345 ink cartridges in reusable condition? A. Reusing the ink cartridges is a great way to contribute towards the wellness of our environment. Please follow the steps given below to help keep the Epson XP-345 ink cartridges in reusable condition. While storing the ink cartridges, ensure the print heads are facing down. By doing this you will prevent the ink from clogging the print heads and also help them remain moist. If your cartridge came with a clip it is good to place the cartridge back in clip after use. This will help the print heads from drying out. You could also use a sealed plastic bag instead of the clips. Keep the copper electronic area of the cartridge away from scratches and dents. If this part gets damaged the cartridges cannot be reused. You could use a sealed plastic bag or the clip as discussed above. Q. I am not able to print with Epson XP-345 using my Windows 8 OS. What is the matter? A. We are really sorry, but Windows 8 operating system is not compatible with Epson XP-345. Q. I tried to perform a borderless photo printing with my Epson XP-345. The first photo was good but the second printout was of very bad quality. What could be the reason? A. This issue commonly occurs when the ink levels are low. Please check the ink level in your printer and install fresh Epson XP-345 ink cartridges if required. This should solve the problem. Q. I recently installed compatible Epson XP-345 ink cartridges (Epson T0807) in my Epson XP-345 printer as per the standard procedure. Despite that, I’ve been getting the message that the cartridge needs replacement. What am I supposed to do? All my work is held up… Please help. A. Please take the ink cartridge out of the printer again and switch the printer off from the main switch board. Keep it like that for about 15 to 20 minutes and turn the printer on, install the ink cartridge once again and try to take a printout. It should solve the issue, but in case it doesn’t, please refer to the instruction manual. If that doesn’t help also, please contact Brother Support; they’ll provide you step-by-step instructions. Q. I bought compatible Epson XP-345 ink cartridges for the Epson XP-345 printer recently. Prior to purchasing I’d consulted several people and read up to ascertain if compatible ink cartridges will work and was happy to proceed as I got the favourable response from everywhere. However, I’ve been getting an error message that the cartridges won’t be supported by the printer as they are not genuine. What should I do? A. First, please open your printer and take the cartridge out. Turn the printer off from the main switch board and keep it like that for about 15 minutes. After that, switch the printer on, reinstall the ink cartridge and take a printout. If this doesn’t sort out the issue, you may refer to the manual or contact Brother Support for alternative measures. Q. Can I know the correct procedure for placing the ink cartridges into the cartridge holder of my printer (Epson Stylus XP-345)? I tried installing Epson XP-345 ink cartridges for the first time but dropped it as I wasn’t getting it right and didn’t want to take chances. Please help. A. It’s quite an easy task to place ink cartridges into the cartridge holder. Please don’t worry; just pick the ink cartridge, place it into the cartridge holder with its base facing down and then push it down gently. Q. How many pages for each of the colour do compatible Epson XP-345 ink cartridges actually print? Do compatible ink cartridges print pages than genuine ink cartridges do? A. Each of these Epson colour ink cartridges prints 450 pages. No, compatible ink cartridges don’t print fewer pages; both print 450 pages of identical quality and finish. Q. Are compatible Epson XP-345 ink cartridges really cost-effective and at par with the original Epson ink cartridges? A. Yes, these compatible ink cartridges from Epson are as good as the original ones. There is absolutely no difference in the quality of output of both; in fact, both cartridges print equally well. Besides, compatible cartridges are available for a much lower price. That means you not only pay much lesser for but actually get more quantity of ink than the original cartridges. Q. How would my Epson printer indicate if the Epson XP-345 ink cartridges (compatible) that I use are expended or low? A. If any of the cartridges you’ve been using becomes expended or low, the print head of the printer will move that cartridge to the indicator position. If the print head does not move, it means your cartridges are not low or expended. Q. I recently changed ink cartridges in my printer (Epson XP-345) but the quality of the print is very poor. I’d opened up the ink cartridge package a few minutes before inserting them. Could that be the reason? What should I do now? A. We should actually take out the ink cartridges just when we’re ready to replace them, otherwise, the print head nozzles turn dry. You need to run the print head cleaning cycle; it should fix the problem.